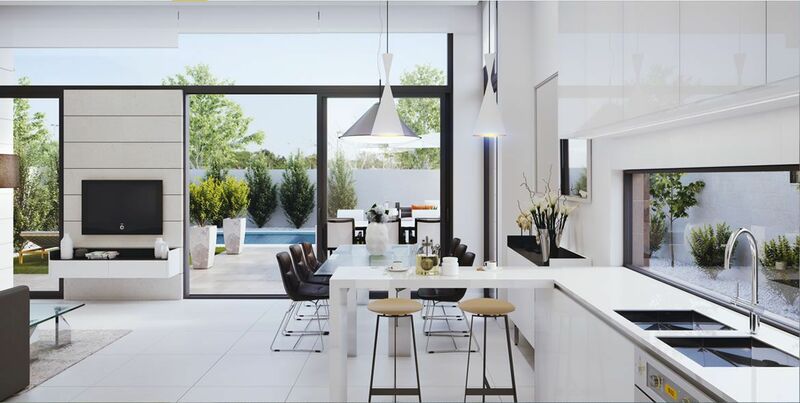 This brand-new development of beautiful apartments, with 2 bedrooms, are located in the very popular area of Villamartin on the Orihuela Costa, next to the Villamartin Golf Course. Complete with a communal pool, playground zones, stunning green areas and a barbecue, thus creating the perfect environment for your home in the sun. This apartment building is built over 4 floors with an elevator, there is underground parking and they are all south facing. They consist (remove s) of a large living room, an open plan kitchen, 2 bedrooms and 2 bathrooms, one of which en-suite. The ground floor apartments have their own private garden, those on the first and second floors have a nice balcony and the third-floor apartments have a private roof top solarium. These apartments come with double glazing, pre-installation for air-conditioning, fitted wardrobes and underfloor heating in the bathrooms. Built in an excellent location due to the proximity to all amenities and only a couple of minutes to the golf courses of Las Ramblas, Campoamor and Villamartin, as well as many bars and restaurants. These apartments are only 5 minutes to Zenia Boulevard shopping centre and 5km to the beautiful beaches of the Orihuela Costa. Alicante and Murcia airports are respectively 50 and 20 minutes away by car. 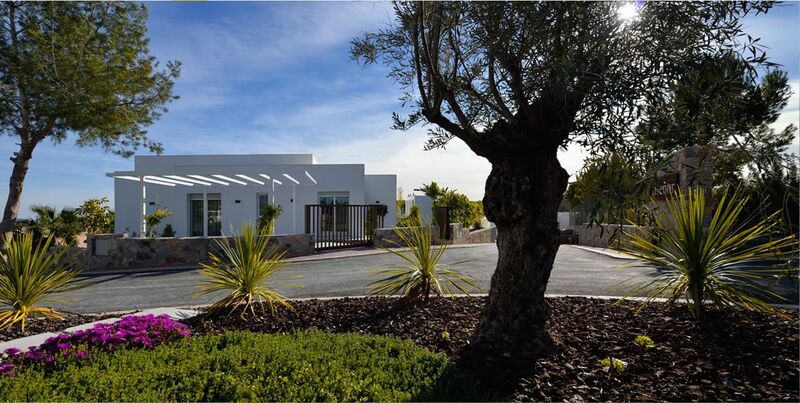 This new development of beautiful apartments is located in the very popular area of Villamartin in Orihuela Costa, next to Villamartin Golf Course. 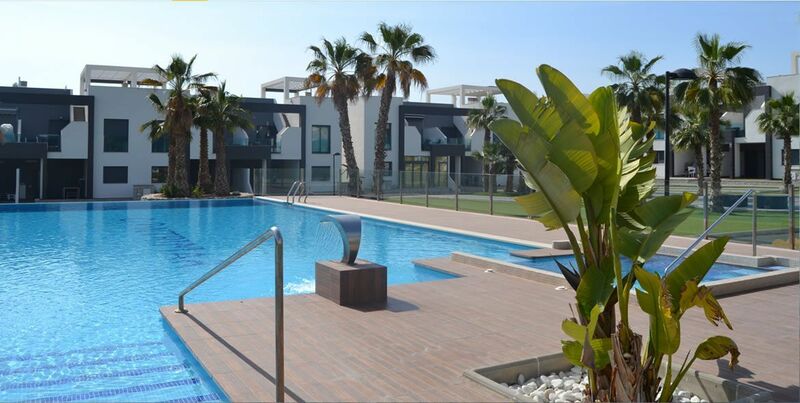 These apartments are built with high quality finishes, with a modern and functional architectural design and are complete with a communal pool and stunning green areas, creating the perfect environment for your home in the sun. These apartments are available with either 2 or 3 bedrooms and 2 bathrooms. All properties have large windows with double glazing, spacious terraces with access from the lounge, pre-installation for air conditioning, motorized blinds, a security front door and fitted wardrobes. An underground parking space and a storage room is also included in the price. An excellent location due to the proximity to all amenities and only a couple of minutes to the golf courses of Villamartin, Las Ramblas and Campoamor, as well as many bars and restaurants. These apartments are only 5 minutes to Zenia Boulevard shopping centre and 5km to the beautiful beaches of Orihuela Costa. Both Alicante and Murcia airports are 50 minutes away by car. 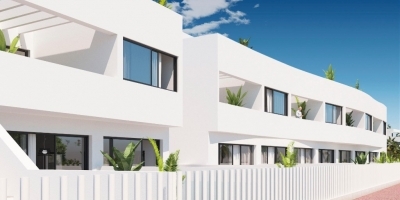 This Modern style complex with 2 bedrooms and 2 bathrooms apartments with spacious terraces is currently being constructed just outside Villamartin on the Southern Costa Blanca. Here you will relax all year round in the communal spa area with heated pool, sauna and gym. The project will have a laned line swimming pool for the most sporty neighbours. Kids will have a great time at the playground area and the beach entrance swimming pool. All these apartments have 2 large bedrooms with built in wardrobes and 2 complete bathrooms with underfloor heating, one of which en-suite to the master bedroom. The bright living room joins the terrace outside almost jointless via the large sliding door. From here there is a lovely view over the communal area and some apartments even have some seaviews. The modern kitchen is equipped with a hob, oven, and extractor fan. The penthouses have their private solarium. All apartments have a armoured door, hot/cold air-conditioning by aerothermal system, installation of telecommunications and an underground garage parking space. A storage room can be available at additional cost. There is a lift in the garage providing access to the properties. This project is strategically located in privileged surroundings, just 2 km from la Zenia beach, in a consolidated urban area with all kinds of services and amenities nearby, with good links, and close to a junction of the AP-7 motorway. Next to the development you have all kinds of services for daily living like supermarkets, banks, pharmacies, transport services, etc. New project of beautiful apartments in the very popular area of Villamartin in Orihuela Costa. Within the urbanization there are gardens, two swimming pools (one of them covered), spa, jacuzzi, gym and a playground for children, making this magnificent residencial an ideal place to live all year around. The building has 4 storeys of apartments, which are available with 2 and 3 bedrooms and 2 bathrooms, one of them en-suite to the master bedroom. The ground floor apartments have their private garden, upper floor apartments have a large terrace and the penthouses have a roof top solarium, which has a jacuzzi. All properties are finished to a high standard and they include: double glazing, armoured front door, underfloor heating in the bathrooms, fitted wardrobes in the bedrooms, pre-installation of air-conditioning, and white goods: ceramic hob, extractor fan, washing machine, dishwasher, oven, microwave and fridge. The ground floor properties also have security electric shutters. All properties include an underground parking space. An excellent location due to the proximity to all amenities and only a couple of minutes to the golf courses of Las Ramblas, Campoamor and Villamartin, as well as many bars and restaurants. These apartments are only 5 minutes to Zenia Boulevard shopping centre and 5km to the beautiful beaches of Orihuela Costa. Alicante and Corvera/Murcia airports are respectively 45 and 55 minutes away by car. MODERN APARTMENTS with the choice of 2 or 3 bedrooms which are extra special for their LARGE OUTSIDE TERRACES that give you the privacy you need. This complex is well positioned with its easy access to the nearby beach. These modern apartments encircle a large swimming pool for adults with a Jacuzzi and adjoins the children’s pool. Surrounding the decked perimeter of the pools there are green lawns and maintained gardens for sunbathing. The ground floor apartments stand out due to their covered terrace and a FANTASTIC GARDEN to enjoy the warm weather of the Costa Blanca. The first, second and third floor apartments have a SUPERB LARGE TERRACE where you can enjoy the WONDERFUL PANORAMIC SEA VIEWS. The top floor apartments not only have a large terrace but benefit from a rooftop solarium with views over Orihuela Costa. Each apartment of this complex has a pre-installation of air conditioning and underfloor heating in the bathrooms; the urbanization has parking spaces, storerooms and communal parking for bicycles. 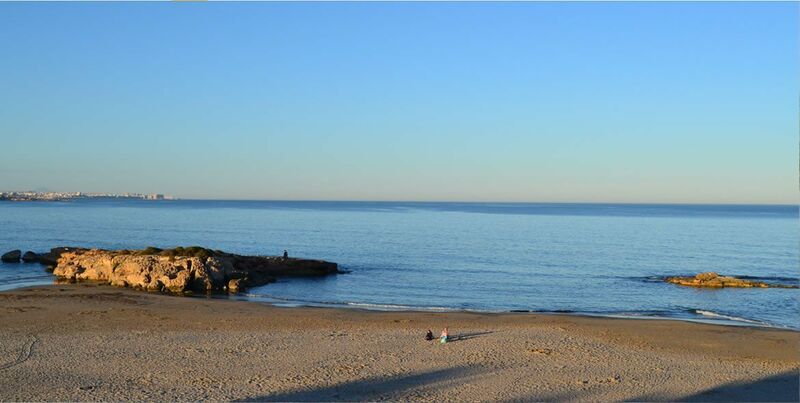 Villamartin is just a short distance to the beaches of Orihuela Costa and its marinas. It is surrounded by all amenities and services, including schools, restaurants, supermarkets, the large shopping mall Zenia Boulevard, and within easy access to nearby towns etc. The airports of Alicante and Murcia are 45 minutes and 20 minutes away by car respectively. Villamartin has some 300 days of sunshine and a 20-degree average annual temperature, as well as lot of large beaches located in the area which were awarded the European Blue Flag for cleanliness, safety and the provision of facilities for the whole family. Villamartin has two championship golf courses; Campo de Golf Villamartin, which was home to the 1994 Mediterranean Open, and Campo de Golf Las Ramblas. There are also several other courses easily accessible by car in the near surrounding area. This lovely new project of 24 townhouses of a modern and functional design, are located in Villamartín, close to all amenities. They are available with either 2 or 3 bedrooms and 2 bathrooms. They have a large community green area with a communal swimming pool and a barbecue area. These townhouses are available on plots ranging from 84m2 to 266m2. They have large terraces, private garden with off-street parking and a roof top solarium. The ground floor comprises of a spacious living/dining room with an open plan kitchen, a utility room off the kitchen and a bathroom. On the first floor, there are two bedrooms both with their own bathrooms. The master bedroom also has a terrace. The top floor has a solarium which overlooks the plot and the surroundings. There is also an option to have an extra bedroom on the ground floor without any additional cost. These excellent properties are constructed using quality materials. There is a landscaped garden with artificial grass, non-slip floor in the porch and terraces, an armored security front door, double glazing, fitted wardrobes in the bedrooms, pre-installation for electric blinds and curtains throughout the property, an alarm and pre-installation for ducted air-conditioning. A private swimming pool is available at an additional cost. An excellent location due to the proximity to all amenities, only a couple of minutes to the golf courses of both Villamartin and Las Ramblas, as well as many bars and restaurants. These townhouses are only 5 minutes to Zenia Boulevard shopping centre and less than 3 km to the beautiful beaches of Orihuela Costa. Alicante and Murcia airports are respectively 50 and 20 minutes away by car. This new project of beautiful apartments is located in the very popular area of Villamartin in Orihuela Costa. Within the urbanization there are gardens, a large communal swimming pool, a playground for children and a gym area, making this magnificent residencial an ideal place to live all year around. The building is built over 4 storeys, the apartments are available with 3 bedrooms and 2 bathrooms, one of which is en-suite to the master bedroom. The ground floor apartments have their private garden, upper floor apartments have a large terrace and the penthouses have a roof top solarium, which has a jacuzzi and a summer kitchen. All properties are finished to a high standard and they include: double glazing, an armoured front door, underfloor heating in the bathrooms, fitted wardrobes in the bedrooms, pre-installation of air-conditioning, and white goods such as a ceramic hob, an extractor fan, a washing machine, a dishwasher, an oven, a microwave and a fridge. All properties include an underground parking space. 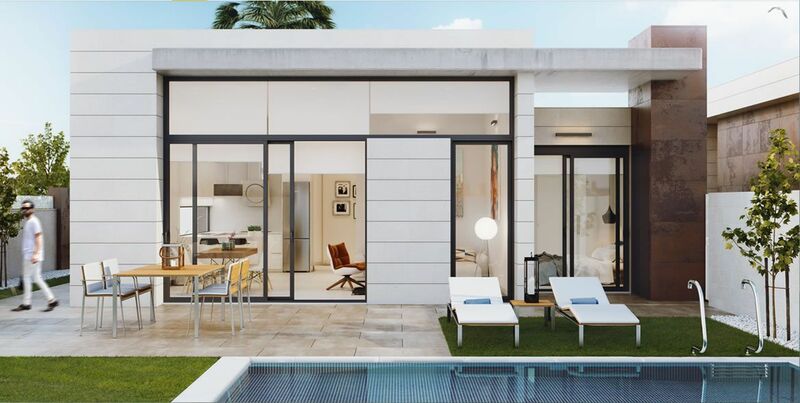 The urbanisation is built in an excellent location due to its proximity to all amenities and only a couple of minutes to the golf courses of Las Ramblas, Campoamor and Villamartin, as well as many bars and restaurants. These apartments are only 5 minutes by car to Zenia Boulevard shopping centre and 3km to the beautiful beaches of Orihuela Costa. Alicante and Murcia airports are respectively 45 and 55 minutes away by car. Located in Villamartin within walking distance to the commercial centre La Fuente, this new complex comprises of apartments and townhouses with HIGH QUALITY FINISHES, with a modern and functional architectural design, highlights of this complex are its landscaped gardens and spectacular communal pool for both adults and children. The building has 3 storeys of apartments with either 2 or 3 bedrooms and 2 bathrooms and townhouses with 3 bedrooms and 2 bathrooms, one of which is an en-suite. All properties have a terrace with access from the lounge and pre-installation for air conditioning. Private parking and storage rooms in the underground car park are optional, with prices from 4.500€ plus VAT. 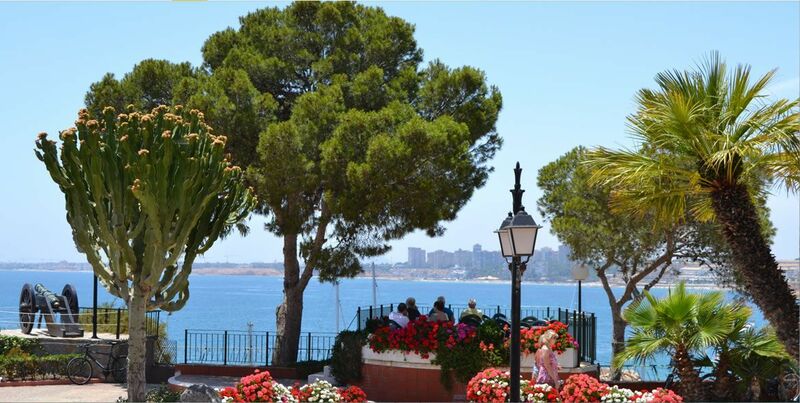 Villamartin is a lovely area of the Orihuela Costa. It’s very near of Torrevieja and is very well connected by the AP-7 motorway. It has amazing beaches with white sand clear blue waters, an excellent place to enjoy the Mediterranean Sea. It’s an ideal place to spend holidays and the perfect locality to reside all the year. The area has all types of amenities such as bars, restaurants, supermarkets, shopping centres, medical centres, golf courses etc. This new project of modern 2 or 3 bedroom apartments and 3 bedroom townhouses is located in a prime location in Villamartin. Offering a peaceful setting surrounded by extensive green areas situated close to all amenities. The complex boasts a communal pool and a lovely communal garden area. The building has 4 storeys of apartments which have either 2 or 3 bedrooms and 2 bathrooms, one of which is an en-suite. The ground floor apartments have a private garden and terrace, first and second floor apartments have a large terrace and the penthouses have several large terraces with fantastic views of the surroundings. Some of the second floor properties are townhouses built over two floors. All properties have a terrace with access from the living room, fitted wardrobes, double glazing, under floor heating in the bathrooms, electric shutters in the living room, armored front door, pre-installation for air conditioning, installation for both Domotic System and an Alarm, as well as private parking and storage room in the underground car park. There is lift service providing access to the properties from the garage. Villamartin is a lovely area of the Orihuela Costa. It’s very near Torrevieja and is very well connected by the AP-7 motorway. It has amazing beaches with white sand clear blue waters, an excellent place to enjoy the Mediterranean Sea. It’s an ideal place to spend holidays and the perfect locality to reside all the year. The area has all type of amenities such as bars, restaurants, supermarkets, shopping centres, medical centres, golf courses etc. This increase allows to add 10 consecutive months with positive percentages and chains in the accumulated of 2016 an increase of 15.1%. 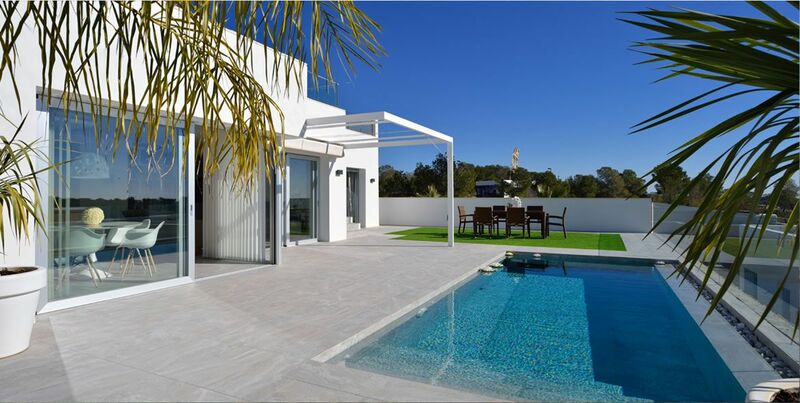 Golf Sun Spanish properties offers you new build properties for sale in Villamartin, Alicante. If you are looking for new build properties on the Costa Blanca and Costa Calida, you are in the right place. Golf Sun Spanish Properties works with the best developers to offer you the best villas, apartments, townhouses and bungalows in the region. Contact us today, tell us what you are looking for and we will be able to work to find the house that best suits your needs.